The sports book at Twin River Casino in Lincoln, R.I., opened in November. Governor Charlie Baker on Thursday proposed legalizing sports gambling in the state, presenting a plan that would allow fans to bet on games at casinos or on their smartphones. Baker’s plan comes as several other states have also moved to permit sports wagering in the wake of a US Supreme Court decision last year that allowed betting on football, basketball, and other games to expand widely beyond Nevada. In New England, Rhode Island has already begun allowing sports books at its two casinos. But the plan, which Baker said would generate $35 million in taxes and licensing fees in the coming fiscal year, would make Massachusetts the first state to allow companies to operate online sports betting without a financial relationship to an existing casino. That could open up the market to new businesses, since companies could secure licenses without the participation of the established gambling industry. The proposal would also be a win for firms such as Boston-based DraftKings, the daily paid fantasy sports company that has been moving into sports books. DraftKings has built a substantial profile on Beacon Hill over several years of regulatory battles surrounding its existing business, and it is keen to offer sports betting independently, without having to partner with casinos. The plan is sure to draw some concerns from the state’s emerging casino industry, which has spent billions building new facilities and would like to add sports betting as another attraction. In other states, such as New Jersey, companies offering online games must do so in partnership with an existing casino. “I can’t imagine that this is a bill that will win enthusiastic support from the casinos,” said Chris Grove, who follows sports betting closely as managing director at the research firm Eilers & Krejcik Gaming. But the casinos may not be spoiling for a fight over the issue. They would be able to build their own in-house sports books and mobile games under the proposal. “It comes down to how much political capital they’re going to be interested in expending to work against it,” Grove said. Casino owners expressed vague optimism over the measure in statements issued Thursday, presenting it as a starting point for a potentially complicated discussion. Baker’s proposal will also have to contend with opposition from groups fighting the expansion of state-sanctioned gambling, who continue to air concerns about the potential effects of making it easier to lay money on the line. House Speaker Robert A. DeLeo said he will be looking for details of how the state will protect against corruption in sports as gambling expands. “The first issue that has to be addressed is that the integrity of the game is protected,” he said in a statement. Les Bernal, national director of the group Stop Predatory Gambling, worries that sports betting could be a gateway for young people into a lifetime of gambling. 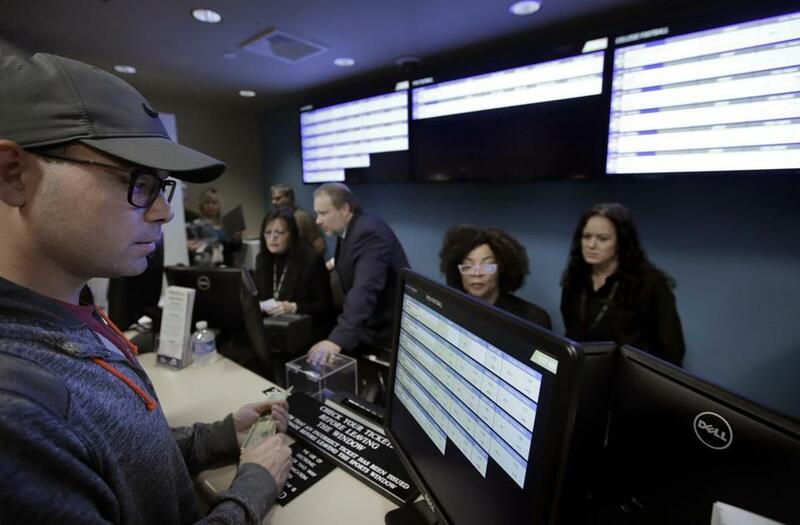 Baker’s office said the expansion of sports betting would be tightly regulated under the Massachusetts Gaming Commission. The legislation would prohibit gambling on college and amateur sports, and gamblers would have to be at least 21. The state would use some of the proceeds from the industry to support people who gamble compulsively. Baker’s proposal sets a tax rate of 10 percent for in-person betting and 12.5 percent for online wagering. Both levies would be on the money that licensed sports betting operators keep after paying out winnings. Baker also proposes setting a 12.5 percent tax rate on daily fantasy sports — paid contests in which participants can win money based on the real-life performance of athletes. Daily fantasy sports have been untaxed as state policymakers have puzzled over their legal status. Supporters of expanded sports betting argue that a convenient state sports betting program could cut into black market options that are already widely available to savvy online users. Estimates have put the national market for illegal gambling as high as $100 billion. The measure proposed by Baker comes as lawmakers have begun to discuss the topic on Beacon Hill at the outset of the two-year legislative session. Preliminary discussions followed the high court decision last spring, but legislative leaders concluded there was not enough time to finalize a sports betting scheme before the end of last year’s session. But lawmakers are under pressure to begin setting up a legal market here before Massachusetts falls behind other states. Nine states and the District of Columbia have already legalized wagering on games, and several others, including Connecticut, are considering it now, according to Eilers & Krejcik. Local sports franchises have generally been tight-lipped about the prospect of sports betting, often deferring to the professional leagues, which have been trying to balance concerns about integrity with the potential for new business opportunities. Boston Bruins owner Jeremy Jacobs, who has been one of the more vocal area sports executives, said he is open to expansion. “Sports betting has the potential to increase fan interest and engagement, which is ultimately good for the fans, franchises, and leagues,” he said in a statement. In a statement, DraftKings expressed optimism the proposal would pass this year. “Legal, regulated mobile sports betting provides the best mechanism to not only protect consumers, but to eliminate illegal offshore gambling, ensure game integrity, generate new revenue for the Commonwealth and fuel the growth of Massachusetts’ sports-tech sector,” the company said.